As a new business owner, you’ll need to learn to let go. There’s often this fear of letting go of tasks, because we think we’re the best to handle the job. Yet, there’s a million other things we should be doing instead. Unfortunately, you can’t expect to be everywhere at once. Nor do you want to be! You want to feel confident that your business can be successful with or without your constant involvement. Systemizing your business doesn’t mean letting go of your business. It gives you the chance to look towards your goals and visualize your next steps. By doing this, you don’t have to worry about the everyday low-hanging fruit. Time management needs to be your starting point. Time is a valuable entity you’ll never be able to regain, so why not make the most of the time you do have? If you question why you’re not being as productive as you should be, you aren’t managing your time right. There are many methods of how you can start getting more done by the end of your day. For more information on this, check out our post titled The ABC’s to Time Management and Getting More Done. There’s a saying, you can delegate the task, but you can’t delegate the responsibility. You have to know what and to whom to delegate those low-hanging fruit of tasks to. Delegating tasks and responsibilities to others you can trust is an important pill you’ll have to swallow to ensure success. That’s where having a game plan can come in handy. With a game plan in mind, you’ll allow yourself to assign the proper tasks to the proper people. This can give you peace of mind and the opportunity to focus on the more trivial tasks. A team is only as good as its leader. The truest statement of them all. This shouldn’t be hard to believe, seeing as there’s hundreds of books based on this thought. Nothing matters if you’re not leading your team in the right direction. As a business owner, we’re required to be effective leaders to run an effective business. You can feel great leadership from the bottom up, and it will affect your team for the better. Systemizing your business begins with you. 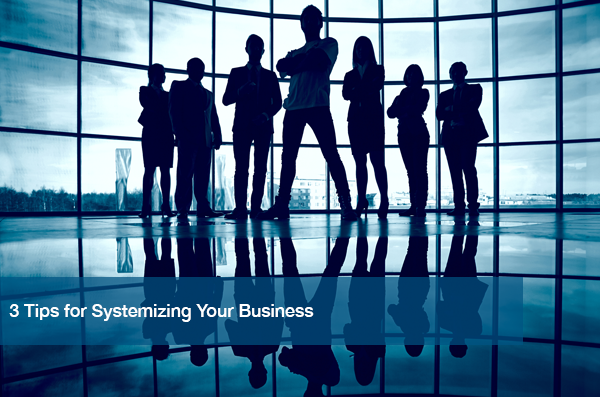 Put your business in the best possible position by understanding how to systemize. Time management should become a priority. Also, giving the right tasks to the right people will help. Last, continue to be the best leader you can be for the sake of your team. If you’re a small business owner who needs a reliable and responsive team to handle your IT, we can help. We’ll improve the efficiency of your company by eliminating your IT challenges. This gives you the opportunity to do what you do best- manage your business. Call (512) 348-8324 to request a quote, or visit our website to take advantage of a free IT assessment today.